Graduate Theological Union faculty members and other contributors will celebrate the publication of their encyclopedia Asian American Religious Cultures at a special event this coming October 1, 2015. 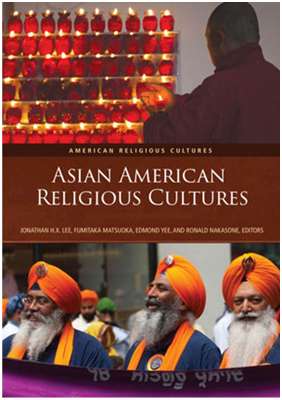 The editors and authors will share their insights on Asian American spirituality and on the project. Six years in the making, the project was spearheaded by Fumitaka Matsuoka (retired), Edmond Yee (retired), Ronald Y. Nakasone, and GTU graduate Jonathan Lee. Matsuoka is Robert Gordon Sproul Professor of Theology Emeritus and the former executive director of the Institute for Leadership Development and the Study of Pacific and Asian American Religion (PANA) at Pacific School of Religion (PSR). Yee is an author, editor, translator, and professor emeritus of Asian Studies, Pacific Lutheran Theological Seminary. Nakasone is a member of the core doctoral faculty at the Graduate Theological Union (GTU) and an artist. Lee is an associate professor of Asian American studies who specializes in Southeast Asian and Sino-Southeast Asian American studies at San Francisco State University. Many of the contributors are GTU graduates. The two-volume, over 1000-page encyclopedia is part of the American Religious Cultures series at ABC-CLIO, which publishes reference books. “The project highlights GTU’s role and scholarship in advancing the religious/spiritual traditions and experiences of Asian American and other peripheral communities. GTU served as an incubator and venue for early academic articulations on the Asian American and Pacific Islander aspirations,” says Nakasone. The event kicks off Theological Libraries Month, established by the American Theological Library Association, which highlights the vital role libraries play in theological education. Please join in celebrating the publication of this important work Thursday, October 1, 2015 at 6:30 pm, in the Dinner Boardroom in the Flora Lamson Hewlett Library.